I made these cupcakes for my friend’s birthday. Very simple, classic recipe, but made with the best ingredients I could find. They were a hit at the party. I’m from Australia, and was wondering what exactly a stick of butter equates to? I’d love to try this recipe with the icing! i just made these for an impromptu valentine’s dinner, and i have to say, i got nothing but compliments. thanks for the great recipe! Thanks! I tried these yesterday – yum! I really enjoy your site. I think I’m going to try these cupcakes with a lime cream cheese frosting (since I love the combination of dark chocolate & tart citrus). Just made these cupcakes — just the cakes, not the frosting — and while I loved the pillowy texture and shape, they tasted kind of flat. Wondered if a pinch or two of salt would help sharpen the flavor? Was wondering if you have tried the Devil’s food cake recipe from the Magnolia Bakery cookbook? I tried it today and was quite disappointed. The texture was good but the taste was pretty blah and not very chocolatey. Sigh, I have had a disaster with these cupcakes. All sunken. Wah. I was making them for my son’s b’day party tomorrow. I decided to cut my losses and just bought the 30 cupcake platter at Safeway. They’re only 4 afterall. The cupcakes totally rocked my world! I have made them twice in the past 3 weeks. Chocolate good, good, good! Now I’ve got to try the chai spice. The hubby is a choco fan but chai is right up my alley! I’m just wanted to say thanks for this recipe–I am not by any means a cook/baker, but I made these for a birthday party, and they were loved by all! I changed the frosting a little bit to one I’d already made–with whipping cream instead of milk, and a little bit of vanilla. Deelish! Made these today. The cake is nice and the frosting is awesome! It made just the right amount. Thanks! Your Cupcake recipes sound great, but I can not find a source for the small and larger size souffle cups that you use. Most places offer the general store liners which will not do. Would you suggest a source for these liners please. fantastic result with your recepis thanks for sharing with me. may i know what type of flour do you use? all purpose unless otherwise noted. your cupcake recipe looks good. i`ll try to bake them tonight. i have to bake 12 cupcakes for dcake decoration class in order to make cupcakes cake. i`ll let you know if my family liked it. thanks for your recipe i made them yesterday without the frosting they test is “give me more” very easy to make. i made out of them cupcake cake. i just spread icing on top and decorated with menora for hanukka. I try this recipe and it taste very good, however could you advised how much the confectioner sugar (1 cup)in gram? because in live in indonesia and we use grams as a measure here. Wow!! My family and I really enjoyed these cupcakes this evening. SO easy to make, and we love how they just taste so natural and simple. Forget Betty Crocker, I’m doing cupcakes the RIGHT way from now on– from scratch! Thanks for such a great website. You’ve inspired me to become an accomplished baker… at least for my family anyways! I LOVE this website. I mosey this way just to see the wonderful artistic cakelets designed by such a creative person! Thanks for the inspiration Cheryl! Now, maybe some help…I just made these cupcakes and liked the recipe, but wondered anyone else’s result? Mine were fluffy and moist enough, but seemed to lack in the “chocolate taste” dept. Did I miss a step? The first time I made these, I had the same result as some of the people who posted already: they missed the real chocolatey taste. The second (and third, and fourth, and fifth, and…) time I made them, I added more cocoa powder and added in a pinch of salt, some melted chocolate, and chocolate chips. And now? They’re pretty much my favorite cupcake ever. In fact, my birthday is today and there’s a batch of these in the oven right now! Who wants a cake on their birthday when you could have cupcakes that taste this good? Thank you so much for posting this recipe! I’ve made two batches in the last two weeks, and they are awesome! and loved by everyone! Thanks so much for posting this – I made them last weekend and everyone LOVED them! Do you soften the butter before mixing? Today I brought vanilla cupcakes to my friends and they were a hit but I had a request for chocolate the next time… These look great! The best (and easiest) cupcakes I have made to date. I made the cherry filling from the cherry vanilla recipe and just iced with a basic whipped cream. All 24 that I took to the office were gone within an hour! Thanks for the great blog, you inspire me daily. Thank you so much for your blog! I have a 16-year old stepdaughter and she and I baked these last night. it was her first experience baking anything from scratch and she was completely bowled over by them. She’ll never eat frosting from a can again! I deliberately chose a simple recipe so as to keep within her idea of cupcake-ness and they were a huge hit. Thank you and good luck with the remainder of your pregnancy. Is it possible to use these with this recipe? I made the chocolate buttercream in this recipe tonight and it came out super thick and rich, almost like a ganache (though not as creamy). The last time I made one of your buttercream recipes (the mint buttercream), it was almost the exact same recipe but with 2 sticks of butter, not one (and no half cup of cocoa powder). I’m wondering if the reason this chocolate buttercream came out so much thicker is because there’s only half the amount of butter as well as an additional half cup of dry ingredients? Could I make it lighter and more fluffy (like the mint buttercream) by doubling the butter? Thanks! Hi there, like your site alot. I made these last night. They were great but it was a little softwet inside although the toothpicks came out clean. And I baked them for 20 mins at max on my oven temp. The highest it has is 220. What should I do? Plus they tend to mountain alot. How do I get them to be flat like yours? Or should I say, perfect? And the frosting, when you say confectioner’s sugar does it mean icing sugar or caster sugar? Cause the frosting came out a little funny, like when you eat it, it seems to have a million small sugar crystals in it when I use icing sugar. And when you said four cups I had to use 1 bag of 500g icing sugar and a little bit more from a new pack of 500g, am I doing it right for the frosting? Do you have a similar recipe in grams instead of cups and stuff? I made these cupcakes last night, and have a few questions. But first, I need to tell you, they are delicious. Moist and tasty. But, I’m not clear, should the butter be at room temperature or melted? Also, they sank a little in the middle and sort of overflowed a tiny but, which made them stick to the pan. Am I doing somthing wrong? I’m looking for a chocolate cupcake with a ‘dome’ shape. Thanks for a wonderful blog site!! One of my favorites. They turned out disasterous. I noticed that you used baking SODA instead of your usual baking POWDER. Was it a mistake in typing? Mine blew up, then fell flat- were a total mess, and I tossed them in the trash! I have made this recipe very many times since I was 13 with rarely an issue. And yes baking soda… Not sure what happened to you. Sometimes baking simply doesn’t pan out. Still happens to me sometimes… Sorry! its okay – I ended up making another recipe of yours…turned out fantastic. your website is truly an inspiration – so much so that I’m opening my own cupcake bakery in SF in the next year. Come by for some! Do you use natural or Dutch cocoa powder? I’m looking forward to trying your recipe out! I was wondering whether mixing by hand would be ok as well, since I don’t have a mixer. [Old one got spoilt] And does it give a different texture as compared to using a mixer? i made them and they were awesome! I tried baking your cupcakes a few times. They taste really great but some how they always shrink after i take it out of the oven. Can u advice? Hey there, the recipe is pretty good – very moist! Tried it out twice – both times the cupcakes sank slightly in the middle! but I guess that was ok – disguised it with frosting. I was wondering if the method had anything to do with it? I tried this recipe tonight and loved the cupcake part. Not used to homemade buttercream, but wow you are talented!! Here are pics of my final creations and my review….I’m new to food blogging and this was a fun recipe to try! I’m from australia, can you tell me if the flour is plain flour or self-raising? Hi! Just to let you know, i’ve been using your recipe and everyone lovess them! I love this recipe, Have done it a hundred times and it’s a true HIT!! THanks again for sharing. I use plain all-purpose flour and granulated sugar unless otherwise noted. these are awful. didn’t even serve ‘em. Just tossed them into the trash and made some from Martha Stewart. Gummy, dense and horrible. Disappointing as they were supposed to be for my son’s birthday. Martha’s came out great. I am sorry to hear that photobella. Given many commen’ters have made the recipe with success (its actually a simple recipe from the Better Homes and Gardens book with very slight changes) any chance that something went wrong with the execution? Always possible but didn’t have time to find out. Oh well — maybe another time. I really like your blog and especially this recipe (I’m still a would-be-cupcakekist) . I allowed myself to use it on my blog. I hope you won’t mind. I love your blog and especially this recipe (I am still a would be cupcakekist). I allowed myself to post it on my blog with french proportion. I hope you won’t mind. Hi, these look yummy! I’d like to make them for my son’s birthday, but we live in a high altitude city. Are there any corrections to make in this case? Many thanks in advance for the help. Wow, Cheryl, these cupcakes were out of this world. I made them for a party with cream cheese frosting with a strawberry on top (celebrating our first spring gathering). 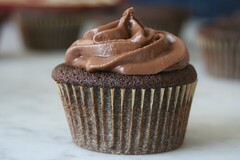 Tonight, I’m making them with the chocolate buttercream. My husband can’t wait!!! LOVE LOVE LOVE your website. Thanks so much. I made these for my daughter’s 8th Birthday Party in Feb with lavender-tinted, cream cheese frosting and a sliced strawberry on top…OH MY! I’ll be making them again this week for a friend’s wedding (this time with candied violets) Thank you! You blog is just lovely; keep up the great work! This is the best devil’s food recipe yet! Easy and foolproof. Try substituting half the sugar for brown sugar, it’s not as sweet but that’s ok. Many people don’t like very sweet cake. Top this with a chocolate ganache icing and you’re ready to party!! These were just not choclatey enough. The frosting was very sugary but not very choclatey. I will look for other options for choclate cupcakes in the future. These are easy and good. I have been searching for a great choc cc recipe & I believe I have found it! I took the advice of another poster & added more cocoa pwdr as well as 2 oz of melted semi-sweet choc. The only thing I found that the tops were slightly crusty & the middle sank a bit but by the next morning the tops were as soft as the rest of the cupcake & soooo moist. Just wish they didn’t sink but could be undermixing or the extra addition of the melted chocolate. I love this recipe! LOVE LOVE LOVE IT!!! Terrific!! I’m so glad I forgot to bring my favorite recipe and had to search – it brought me to your site! Thanks for sharing such beautiful recipes and pictures. I was afraid to test your all-in-at-once strategy before a big party, so I made them in my usual order – creamed butter and sugar, then eggs, wets, and finally drys. I also used buttermilk in place of milk. I made 24 mini’s and 6 regular-sized, and can’t wait to get the frosting on them tomorrow! For those who have commented that these aren’t ‘that chocolate-y,’ I think they’re the perfect devil’s food cake, but devil’s food is not death by chocolate. Hi..had some issues with the batter…the butter was a little clumpy. It didnt mix in well. What did I do wrong? Maybe melted the butter? I used room temp. They are in the overn now..hoping they turn out ok…fingers crossed? I just wanted to stop in to tell you that I made these cupcakes and used your filling recipe from the chocolate cupcake with peanut butter filling recipe. They came out amazing! Thank you so much! I wrote a blog post about it and posted pictures there as well. Thank you so much for your amazing recipes! but the cupcakes turned out great. i did substitute a few spoonful of milk with sour cream because i have some leftover. i don’t know if it made much of a difference in terms of moistness. Tried these yesterday, and instead of mixing all as suggested, I used your previous tip of creaming butter, then eggs, sugar, vanilla for 3 minutes. (Butter was ROOM TEMPERATURE, an instruction I’ve been having trouble following but is oh so important). I used 1 cup all purpose flour, and 1 cup self-rising flour and added a pinch of chili powder. They turned out heavenly. Filling them 3/4 full was the best, because they don’t dome as you said, they will either sink or flatten. I also substituted Bailey’s Irish cream for the milk in the buttercream frosting recipe… Oh yes… they were devil’s food, all right. Thanks for the share and pro tips! hello, can i know is it 350 degree celcius or fahrenheit? thanks. hello, sorry to disturb, but may I know does cocoa means cocoa powder? and does the flour means self raising or plain flour? and the vanilla is referring to vanilla extract or essence? thanks in advance. TOTALLY NOT IMPRESSED!!!!!! These cupcakes flopped and looked like very flat muffins. I don’t know what kind of milk YOU used, but I used skim milk because that’s all I drink and these just did not turn out. I used everything else in the ingredient list exact. Don’t know what happened, but I do NOT recommend this recipe at all!!! I had to throw everything in the garbage. What a blasted waste of money and time!!! I was trying to make these for a wedding and would have been embarassed if they would have even turned out because the flavor was not there either. This recipe stinks!!!! YUK!!!! @ comment #84…You used Skim Milk. you shot yourself in the foot with that one. who does that? Try following a recipe the way it’s written. If she used Skim Milk, she’d specify that. Skim Milk has like zero fat content, it won’t work well in a recipe like this. It’s common sense, or so I thought. I tried these and they came out like rubber, they hardly rose at all. It was shame as they tasted quite nice but the texture was odd. I may try mixing them in the conventional order rather than all in one go and see if it’s any better. I was some of your recipes require you to cream the butter and sugar and some don’t why is that also when I try to cream the butter and sugar it doesn’t seem to come out creamy it’s still thick and sometimes my cupcakes are very dry and dense not light abd fluffy what could I be doing wrong?? Making these tomorrow for chocoholic Mom’s birthday…thanks for the recipe. I try whenever possible to use natural ingredients and am so happy to have an alternative to a pre-packaged mix for Mom’s favorite Devils Food. I did them! They are delicious! I filled them with nutella and a cheese frosting on top! Hi, I was wondering if you use granulated sugar in the cupcake recipe or powdered sugar?